Travelers in search of a gastronomic experience will find eating and drinking in Varanasi a treat. There is a wide variety of local delicacies to feast on, as well as traditional Indian cuisine offered in many food outlets around the Holy City. However, some tourists might find it astonishing to discover that most of Varanasi menus are vegetarian. Unfortunately, despite Varanasi sitting close to the Ganges River, the river is too polluted to provide any freshwater fish to the city. Vegetarians all over the world will then surely rejoice in the varied Vegetarian offerings of Varanasi. The ascetic quality in the Varanasi diet may be in conjunction withthe people’s belief that the gods must be appeased by not allowing the killing of other creatures. According to ancient religious scriptures, in order to have spiritual advancement, one must have the purity of mind and body. Thus, food prepared in the city is simple and fresh without any garlic or onions. Many people would wonder what is it aboput these two spices that make them exceptions. It is believed that spices bring an impression of harmony in a person’s body, mind, and spirit. Onions and garlic are aphrodisiacs as they subsequently generate heat, which according to teachings, can cause unruly and uncontrolled feelings. However, there are certain masala spices thrown in some of the dishes in sparing doses like red chili powder and salt. But one thing travelers can be guaranteed when in Varanasi is that food prepared in this area is fresh. Another assumption involves Lord Shiva, the ruling deity in Varanasi, and his diet. The god’s diet consists mainly of rice, sugar, grain, milk, ghee (clarified butter), and wood-apple or bel fruit. Thus, the famous Varanasi delicacies are malai, rabri, Dum Aloo, Aloo Chaat, and Pani Puri. Most of these sweets are sold in hole-in-the-wall shops found all over the city while some can be found in high-end cafes. Rabri is a sweet dish with main ingredients of yoghurt and flour. It is typically eaten during lunch as soup. Malai is clotted cream used in making malai kulfi, a frozen dairy dessert. It closely resembles an ice cream and comes in many flavors such as mango, raspberry, saffron, and cardamom. Dum Aloo is a dish of potatoes that are deep fried and then cooked in curd-based gravy with spices. Aloo Chaat is a kind of street food that consists of fried potatoes seasoned with an assortment of spices eaten as a snack or served with a light meal or salad. Pani Puri is another street snack made from puri or unleavened bread filled with a mixture of potato, chaat masala, chili, tamarind, chickpeas, and onion. Alcohol is not widely available in Varanasi as they are only offered in select restaurants and hotels. In replacement, Bhang, a potent form of marijuana is mixed with lassis making it extremely popular during holidays. Another milk-based cold drink called thandai is also a must-try. 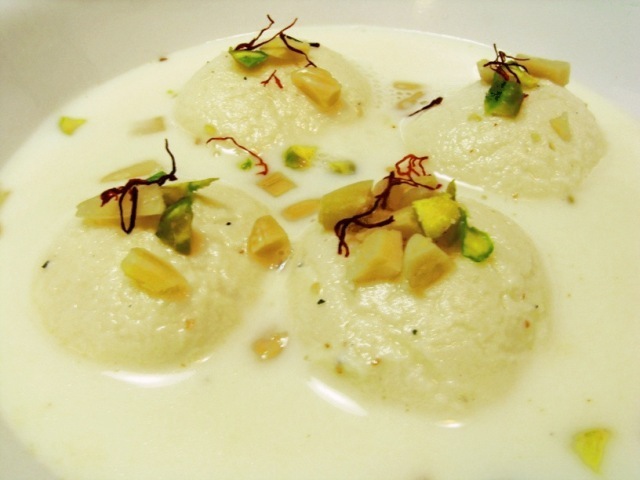 It consists of almonds, pistachios, kessar, and is topped with malai. Since many foreign travelers visit the ghats, a thick concentration of restaurants offering Western and Middle-Eastern cuisine is available in that area. With all these unique offerings, travelers will surely have a fun and fulfilling experience when eating and drinking in Varanasi.